We were lucky enough to stay at the chic hotel The White Elephant. This luxury inn was the absolute perfect spot to set the tone for our vacation. This historic landmark hotel since the 1920s boasts amazing harbor views, upscale amenities and the perfect location just minutes from town with all of those amazing shops and restaurants. With 54 chic rooms and suites, our room was to die for. Along with a bedroom, we had a sitting room equipped with comfortable seating in front of a relaxing fireplace adjacent to our own private deck. We thoroughly enjoyed lounging on the harbor side lawn, meals at Brant Point Grill, the library and fitness center. Guests also can unwind at the White Elephant Spa indulging in an array of massages, facials and body treatments. If you’re looking for a truly unforgettable stay, this resort is for you. 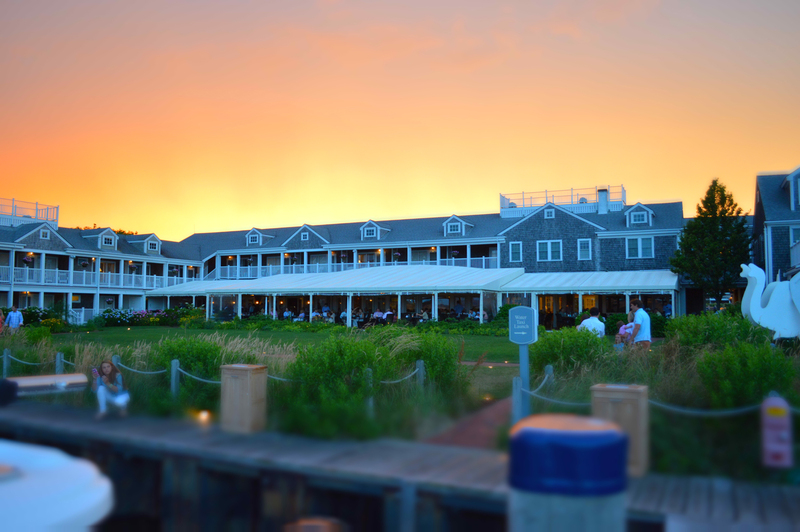 Located onsite at The White Elephant hotel, The Brant Point lounge was our go-to place for relaxing meals overlooking the harbor. For breakfast, we enjoyed fresh berries, and staples like omelets and waffles. However, we couldn’t help but notice one breakfast item. For those feeling decadent, opt for the Billionaire’s Benedict consisting of the finest ingredients —Champagne Poached Eggs, Two 4oz Filet Mignon, Lobster Claw, Sturgeon Caviar, Crème Fraiche, Potato Pancake, English Muffin. For dinner, start off with 2 Dz Oysters with Cherry Tarragon Mignonette and a Nantucket crab cake and indulge in a 2 lb Lobster for your main course, or Confit of Duck and Foie Gras Bolognaise with Shredded Confit Leg, Foie Gras and Orange Tour Chon, Forest Mushroom, Rigatoni. Whether you dine for breakfast, lunch or dinner, taking in those harbor views will make you want to stay for hours.